Most mornings when my alarm goes off at 7:30 I get right out of bed because I know I have to get the kids breakfast, make lunches, and get them on the bus. Then I hit the gym. Today is Saturday and when my alarm went off at 7:30 I knew I didn’t have to do anything for the kids. I knew my favorite gym class, Body Combat, was at 9, though. Yet it was dark outside, my bed was so warm and cozy, and I was still tired. I could have easily gone back to sleep for another hour. But as I lay there during the time I hit snooze and waited for my alarm to go off again I couldn’t stop thinking of all the reasons I should get to the gym this drizzly, Saturday morning. Maybe my stomach would finally stop gurgling from eating nasty movie popcorn for dinner last night. Maybe I’d finally work out that lactic acid that had built up in my calf muscles from my Insanity workout on Wednesday. Maybe it would help my headache go away. Maybe I would feel better. Not necessarily physically, but mentally. That in turn would help me be a better mother throughout the day. Weekends in the winter are especially difficult for me. Partly because I am used to having the house and time to myself. But also because the weather doesn’t exactly cooperate to be outdoors all day like in the summer, or fall and spring weekends. Now I have two children at home demanding to be fed, begging for screen time, and complaining they are bored. If it weren’t raining today, believe me, we would be outside kicking the soccer ball around, playing catch, riding bikes, anything but staying indoors. On Thursday we were outside after school even though it was 20 degrees. It felt balmy compared to the two prior days of 8 degrees! 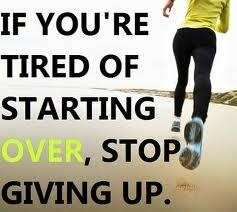 So forget the excuses and get up and MOVE! You only live once and you should make the most of it by staying healthy. Walk your dog. Play some catch. Go to the gym. Do some jumping jacks in your living room. Whatever it takes. Your body will thank you.